Every home that uses a central heating or air conditioning system uses a thermostat to regulate the temperature of the home. Thermostats allow you to pick the temperature you want the room to be, while showing you the current temperature. There are several models of thermostats available for your home, from old fashioned mercury thermostats to digital thermostats that you can program. For many years thermostats came in one general variety; you set the temperature you wanted manually every time you wanted to change it. The variety of thermostats available today, however, has increased dramatically to offer several different options for consumers. If you're planning on replacing your existing thermostat, take the time to discover what type of voltage it runs on now. 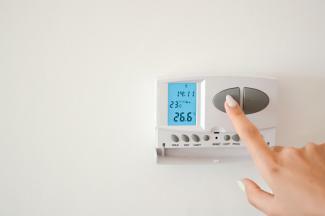 Thermostats can run on one of two types: low-voltage and line-voltage. Low-voltage means that the thermostat reduces the voltage from 120 volts - the amount coming from your circuit breaker - to 12 volts, which means your thermostat doesn't take much electricity to run. Line-voltage thermostats run on the full amount of electricity - 120 volts - that powers your home. They cost more to run, but more importantly, attempting to wire a low-voltage thermostat to a line-voltage site will short out the new thermostat. 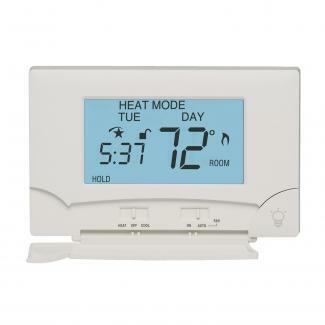 Seven Day: A seven day programmable thermostat allows you to vary the temperature for every day of the week. This can be ideal if you work from home part-time, or if your kids get home from school at varying times each day. These can be less than ideal if you're gone at consistent times during the week, because they can be more difficult to program. Five and Two: A five and two day thermostat gives you one setting for weekdays, and a second setting for weekends. This model is best for homeowners that have consistent weekday and weekend schedules and is the easiest to program. Five, One and One: A five, one and one day programmable thermostat gives you one setting for weekdays, and separate settings for Saturday and Sunday. If your weekday schedule is typically consistent, but your weekend days vary, this is the best model for you. While increasingly less common, thermostats are still available in non-programmable varieties as well. While these used to be powered by mercury, newer models are digital and wire to your home's electric system. Non-programmable thermostats are cheaper to purchase that programmable models, but require you to manually change the temperature. Forgetting to lower the temperature before you leave for the day could result in higher energy bills. These thermostats will help lower your home's energy bills, while giving you plenty of options for programming, along with ease of installation and use. The Nest is a digital programmable thermostat that actually programs itself to best accommodate your needs after only one week of use. This thermostat uses sensors to determine whether or not you are home and automatically adjusts the temperature accordingly, remembering your favorite settings and the times of day you like them at. Best of all, when The Nest rolls out new software it automatically updates all previous units, so your thermostat stays current. 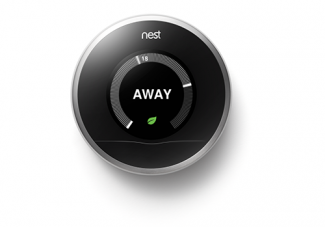 The Nest is low-voltage, works with both heating and cooling systems and retails for approximately $250. Top Ten Reviews gave it a 9.95 out of 10 - one of their highest ratings. 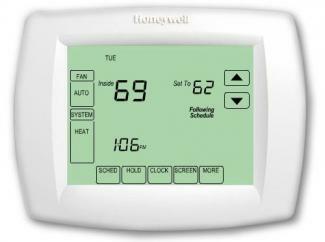 The Honeywell Vision Pro TH8110U1003 is a seven day programmable thermostat that gets great reviews from consumers. The Vision Pro is low-voltage with a touchscreen that handles both heating and cooling. For ease of programming, the thermostat can be removed from the wall, then returned once you've set your schedule to where you want it. Consumers like the ease of programming and the fact that it has a locking feature to keep kids or guests from overriding the program. It retails for about $150. The Lux TX9000TS is touted as a programmable thermostat that is of the easiest to use and easiest to install. The Lux TX9000TS is low-voltage, with a touchscreen and seven day programming. It installs in less than 30 minutes, and can be programmed for all seven days in less than 25. It includes an energy usage monitor that helps you keep track of your energy usage as you heat and cool your home. It gets an overall rating from Best Programmable Thermostat Reviews of 4.3 out of 5 stars and retails for around $80. 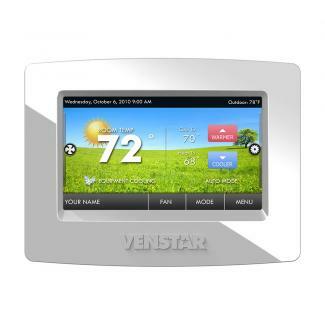 The Venstar T5800 ColorTouch Touchscreen Programmable Thermostat is a high-tech thermostat that gives you plenty of options to choose from, including the background picture of the display. It allows you to program up to four heating and two cooling stages, and includes an outdoor sensor to display the temperature outside as well as indoors. It's low-voltage and installs easily. It also allows you to choose how many days you program it for - make it seven day, or five, one and one - whatever you are most comfortable with. Consumers like this thermostat for its ease of use and the fact that you can operate it remotely using WiFi. It retails for around $170. Thermostats are typically sold separately from heating and cooling systems and can be upgraded even when the entire system is not. If you are considering getting a new thermostat for your home, have an electrician check your line to determine the type of thermostat you require. Regardless of the type of heating and cooling system you have in your home, installing a programmable thermostat can be a smart way to save energy and related costs this year.